Rembrandt was obstinate, dogmatic, cunning and capable of a kind of brutality. He was no saint. But through his art he searched for a way out of the darkness that was Dutch society and out of his own personal darkness too; to find the human in the darkness. The writer and art critic, John Berger considers that there is great difference between the graphic work of Rembrandt and the paintings. When drawing, Rembrandt was totally in control and master of space, proportion and the physical world, his paintings however, display little logic or spatial continuity, “the world he presents in his paintings is seriously dislocated”, says Berger. Rembrandt placed his colour directly onto the blank canvas with no preliminary under-drawing to guide his brushes, he was aiming not just to render a likeness of all those fascinating facial features but to make visible the individual’s corporeal space – the authentic sense of personal bodyness which is always bound by the laws of the body, but with its landmarks, its emphasis and its inner proportions continually changing. Visiting the exhibition of Rembrandt’s late works at the National Gallery you witness an artist with a relentless experimental approach to technique, and extraordinary skill in rendering the effects of light, an appreciation for mundane or even ugly subjects, an avid plundering of diverse visual sources for creative inspiration and a quest to understand and represent humanity’s deepest motivations and emotional states. Rembrandt could not only find an outward likeness but could also get inside sitters; inside the part of them that makes them unique; the thoughts, the hopes, the fears, the loves, the desires, all enunciated using sometimes carefully placed, sometimes energetically random, coloured, oil paint on canvas. He seems particularly comfortable with old and life-weary humanity; two particularly fine examples are ‘An Old Woman Reading’ where light from the book she is reading reflects upwards to bath the underside of her concentrating face in a wonderful glow; ‘Portrait of Aechje Claesdr’ in which the woman’s expression is so kind and familiar that you feel you know exactly what she is like; and there are his portraits of his own ageing self. 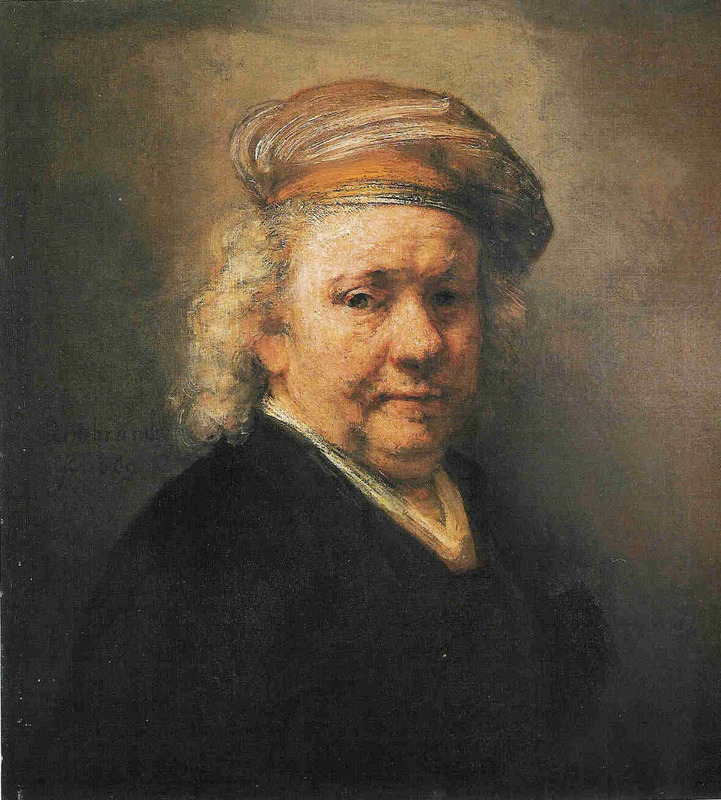 In Rembrandt’s ‘Self Portrait’ 1669 he records his slack, puffy face with clinical detachment: flesh sags loosely beneath his chin and a thick swipe of paint emphasises the pouch under his right eye, and to me there is a sense of humour, even a glint in his eyes which denote a sense of achievement, a final self-appraisal that seems to have told him that he has achieved all he had ever wanted to with his paint brushes, pencils and engraving tools.